Whistleblowing in the NHS – how safe are you? This is a question for staff and patients in the NHS. As an NHS staff if I suspect something is wrong, simplest thing would be to raise my concerns to my line manager. Simple. After all, we have decided to work for the NHS because we care? We care for patients and other staff who are placed under our care. Our managers would be grateful to us, surely, and make arrangements to investigate and where appropriate, put things right. After all it’s in patients’ interest. Wrong. This is not how the NHS currently works in many hospitals, care homes, institutions and clinics. Staff do need to raise concerns – why? Because, like in most walks of life, there will be situations which needs special attention. There could be issues, such as potential fraud, mismanagement of resources, safety issues, staff training issues which can relate to both staff and patients. There are of course, numerous more examples. As staff we have it ‘ingrained’ into us as part of our training about having ‘duty of care’ and reporting anything that we feel needs attention. Doing otherwise and ignoring would constitute neglect. Staff being able to safely raise concerns is vital to patient safety. One of the earliest NHS whistleblower who has been in the public domain has been Steve Bolsin, who first raised concerns over 20 years ago about children’s heart surgery at Bristol. He is now based in Australia. Since then not much has changed. Whistleblowers’ raised concerns are still ignored despite in many cases, having extensive evidences. Whistleblowers are subsequently victimised and persecuted and find themselves being accused with false counter allegations, despite in most cases there are lack of evidence of any wrong doing. In some cases hyped up to be more serious than it really is as in David Drew, who was accused of quoting bible in a meeting. This was deemed to be more serious than the concerns he had raised about child safety, which led to the death of a child due to arrogance and neglect. Whistleblowers within NHS come from a wide range of occupation, which include Chief Executives, such as Gary Walker and John Watkinson. Both raised patient safety concerns and both lost their jobs. Since becoming a whistleblower myself, nearly 5 years ago and developing my website, I have been in contact with numerous whistleblowers. Many of the cases are devastating where the whistleblower have suffered gross injustice. Many cases are truly heartbreaking. One example, is that of a senior staff member who was raised concerns about dealings with child abuse. She has now not only been left without a job, she is homeless, and now lives in a friend’s garage and depends on provisions from food bank. Another is a single mother of 2, who also now has to rely on food bank and in due time may have her home repossessed. I too, am likely to lose my home soon whilst suffering cancer. Many of the whistlebowers face years of stress. Many end up having counselling or have nervous breakdowns. It has profound effect on close family & friends. Many relationships breakdown under stress as in reported cases of Edwin Jesudason and Gary Walker. 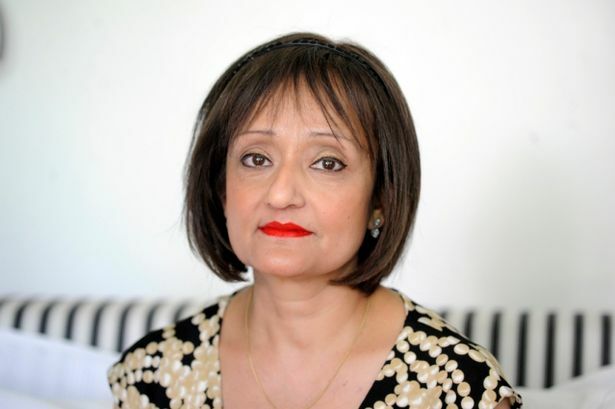 Sangita, Raj Mattu’s wife on Channel 4 news said that they have been unable to have children due to ongoing legal battle and stress. There are also known whistleblowers who have committed suicide or have suffered mental breakdowns, as it all got too much for them. Their health take a toll. David Drew has suffered serious health problems, despite leading a healthy life. I have developed cancer, which numerous consultants believe is stress related. There are very few known whistleblowers who have faced legal battle with their trust and have return to their workplace. I only know of one – Ramon Niekrash. However, he was left with legal fees of £120,000. 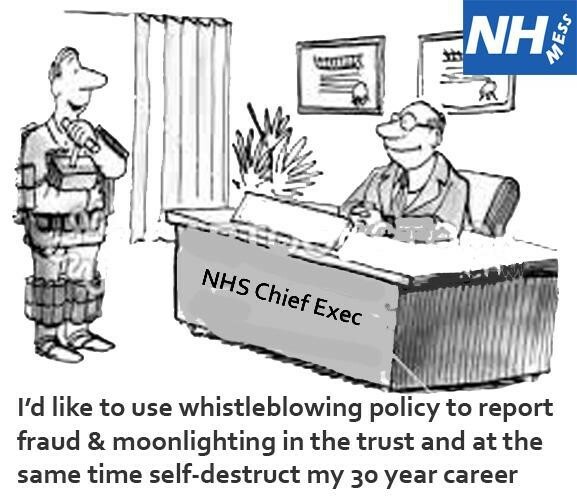 Nearly all NHS whistleblowers, once dismissed, never return to their workplace. Very few continue to work in their field of expertise and even fewer manage to secure permanent posts. This is because of existence of blacklisting within the NHS. There is of course in addition gradual loss of skills once being unemployed. For many, only option is to leave the country and look for work in other parts of the world, such as Steve Bolsin. So why do whistleblower’s bother to raise concerns or blow the whistle where not only are their concerns on the whole are ignored but their whole career is destroyed? Because on most occasions, they feel they are simply doing their job and are confident that their concerns will be sorted. Very few give a thought for their own safety as naively it never enters their head. However, having made an example of a whistleblower, trusts send out a strong message to other potential whistleblowers. Many are deterred from speaking up. This means that patient’s safety is compromised. If staff are too scared to speak up, it means that the risk factor is never investigated, let alone sorted. So why are whistleblowers persecuted? In some cases by bringing to light the concerns could be a source of embarrassment to senior managers and could attract unwanted publicity. It could be a costly expense to fix and organisations may have targets they have to meet. Individuals within the organisation may have vested interest for example, as in cases of theft and fraud. It could also be due to basic retaliation of ‘I go or they go’ (this could be due to the whistleblower having raised concerns about them) or it could be that individuals are looking out for their colleagues who have done wrong, but have a strong position in their organisation. Those spending public money covering up their wrongdoing have been getting away with it for over 15 years, since Public Interest Disclosure Act, PIDA, was introduced. The Chief Executive, The Medical Director and The HR Director are ultimately responsible within Trusts to ensure that victimisation of whistleblower does not happen, but unfortunately far too often, they are part of the victimisation. Trusts are given easy access to legal funds which are paid by taxpaying public. These funds are authorised by the Department of Health and paid out by The Treasury. Ironically, huge sums of money which should have gone into patient care is used to fight and get rid of whistleblowers – the very people who care and want to protect the patients and the health service. It would be interesting to survey the tax paying public to have their views on their hard earned money is continually being wasted on getting rid of whistleblowers. After all, they are paying for this wastage. Raj Mattu’s case is a good example, where not only did Raj suffer for 13 years, but it has costed the tax payer £20m. Money which should have been used to benefit the patient. In addition, more recently, case of Arjuna Weerasinghe, where seven figure settlement is now being considered. Of course, it isn’t just money that is being wasted, but there is also huge waste of expertise at all levels, which is being drained from the NHS. The very people who care what happens in the NHS are the very people who are being removed and having their lives destroyed. Why is this allowed to happen? Nearly all whistleblowers once they realise they are in trouble and are in need of urgent help their first port of call is to their unions. I have yet to meet a whistleblower who has been successfully supported by their union throughout the ordeal. I am not sure whether this is due to lack of understanding, lack of money, or simply they want to remain in good terms with individual organisations. Strange as it may seem, in some instances, unions have turned on their own members. The next step for a whistleblower is to get legal advice. Some firms are happy to give free short advice over the phone. Consultations can be expensive but vary. Mine cost £398 per hour, four years ago. Often with no money, whistleblowers setlle for ‘no win, no fee’ arrangement. However, legal costs escalate at an alarming rate. Many turn to policies in their home insurance. This has certainly saved the day for many, such as Anabelle (Loo) Blackburn and Jennie Fecitt. However, unfortunately some, such as mine, there was an opt-out clause, where if you belonged to a union, your policy will not be covered. My legal fees had escalated to £130,000 on a ‘no win – no fee’ basis. Nearly all whistleblowers I have come across had written to both Care Quality Commission and Department of Health for help. Virtually all have been left without help, despite having strong evidence. Nearly all have received a standard reply, which stated that they could not get involved due to ongoing legal case. So, where is a whistleblower to go when they find themselves in deep water? Nowehere, is the answer. No one will intervene or inspect surroundings of the case. Cases are frequently dragged out over years before reaching a settlement. This is often deliberate attempt by Trusts who have endless legal funds to drain any funds that the whistleblower may have, to reach a settlement in their desperation. Also, if they are on ‘no win –no fee’ arrangement, they often have to settle out of court with substandard pay-outs, often just enough to cover their huge legal expense. In contrast, trusts and organisations are fully supported with advice and access to funds by The Department of Health. So, stating that either Department of Health or Care Quality Commission cannot get involved in their response to a whistleblower is untrue. They do get involved, but simply not on the side of the whistleblower. So, having suffered over the years and finally reaching some sort of settlement, you would think that there will be some help. No, is the answer. With career and any remote job prospects, livelihood, personal life and health destroyed, there is simply no help. Even when proven to be a whistleblower by courts, there is no help. Whistleblowers are left abandoned. So, who should be there to ensure that whistleblowers, responsible members of our society are taken care of? Fingers currently point to Jeremy Hunt and The Department of Health. After all they are ultimately responsible for the running of the health service. To say that they ‘cannot get involved’ is no longer acceptable. Hunt has instigated review into NHS whistleblowing led by Sir Robert Francis QC. Results and recommendations of which are due in November. This is a step forward. However, any recommendations made will need to be effectively implemented and not ignored. I have yet to hear of any senior managers, directors, executives held to account for their treatment of whistleblowers. Yet, nearly all NHS organisations now have whistleblowing policies. Clearly, written policies are not worth the paper they are written on if no one acts on them. It needs a responsible governing body to take responsibility and ensure that all staff, patients and public for whom they are in charge have an in depth understanding, compassion, leadership and willingness to drive this forward. Until this happens, lives of both patients and staff will continue to be destroyed.